Welcome to the official website of The Nectar Project LLC. 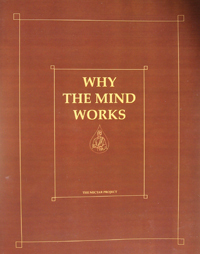 Here you will be able to read an excerpt from our book Why The Mind Works, and purchase it. Through the book, we move toward bringing together at the root cosmology, scientific psychology, mystical experience, and the religious impulse. The needs of modern man go beyond what the old versions of these separate disciplines offered. And beyond the old versions of psychotherapy as well. The Nectar of Life is all that matters, and miracle-mindedness is needed to go beyond the obstacles in the mind that block the Pure Experiencing. Be your own guru and transcend all you have been.